What's inside? 14 Bass Patches10 Lead Patches7 Pad Patches6 Plucked Patches3 SFX Patches. This soundbank contains 40 patches which are dedicated to the dark side of cyberpunk themed music. 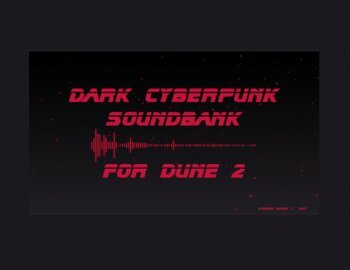 From classical to modern synthwave, and even to the big cinematic Scifi - "Dark Cyberpunk" for Dune 2 delivers the tools to create music for these genres. Almost all patches have modwheel action. From very usable transition effects to morphings that will transform a patch into a second, different sounding instrument.